Well it's now the post holiday let down hahaha. Actually my holiday was great. I got to visit with family that I don't get to see all the time and also got some nice things, nothing huge or anything, but many practical gifts. I, however did not get anything horsey. My parents are pretty much against getting me anything to do with horses. They have given me money before which I have spent on horse related things, but that's about as close as it gets. But on Christmas eve, well in the afternoon I stopped by the barn on my way to the parents house and gave Possum some treats and pats and attention inside his paddock. It was actuallya fairly warm and sunny day so it was nice just hanging with him and the other horses. I think Possum was a little confused that I wasn't taking him out to ride or anything, cause aftre I snuck under the gate he was leaning against it trying to get out. You would think the high heels and smell of perfume would have been his first hint that I wasn't riding, but he obviously didn't get it hehehe. Saturday, teh day after Christmas I went out to the barn not dressed in heels and nice clothes, with the intention to get in a good ride. It was pretty cold, with temps just hovering around 20, but that didn't deter us. I got Possum dressed and walked down to the arena. I got on and we both were stiff and cold. I also hadn't ridden him since the jump-off so I took a long time walking and trotting to get those muscles warm and working. He had a good spring to his step which was good cause I really wanted to use that energy and do some dressage work at the begging of the work-out. After both he and I were thoroughly warmed up and I had finally shed my winter jacket to just a sweatshirt, we were ready for some real work. We worked on some shoulder in and haunches in. We did some lateral movements across the arena with a try at some half pass. We also did some lengthening down the long side in the trot and worked on coming back to collected trot but not losing the impulsion. We were actualy clicking quite well and he was listening and made good attempts at each movement. His poll started to become more elastic and longer. His shoulders weren't as stiff and he was really coming through his back. I was already pleased with the flat portion of our ride, but I knew that the next day was going to be stormy and gross so I really wanted to get in a good work. We warmed up over some jumps at the trot, making sure to take them all in both directions. 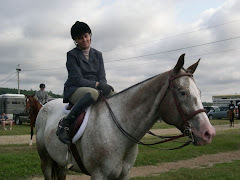 While we warmed up I focused on my position and keeping my heel lowered and thigh and calf contact. I am also finding that I'm focusing too much on the jump itself. Basically I'm over analyzing and feel like I need to make all these timy adjustments instead of just riding to the jump. SO I've really started to focus on looking past the jump and letting the pace and rhythmn take us to the base. It's going pretty good, but old habits die hard, especially when the jumps get higher. I also have noticed that I tend to shift most of my weight to the outside when going around corners or tight circles. I have really been after myself to keep equal weight in both stirrups, or just dropping my stirrups all together so that I'm not throwing my horse off balance. 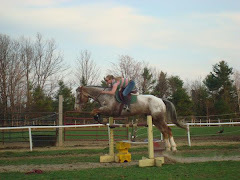 I then got off and raised the jumps all to atleast 2'9" to about 3ft. I then had my friend make up some courses for us to do. It was good for Possum and I to start to put some courses back together since we have been focusing a lot on either single jumps or lines and working a lot on our rushing issues. I really wanted to put our training to the test. He did really good for the most part, and I tried to pull my weight as well. There was also a pretty tricky broken line which caught him off guard at first, but then when I gave him more clear and better directions he was very honest. We did about 4 or 5 courses. He didn't struggly at all with the height and his rushing issues have subsided ten fold. Ofcourse we have some polishing to do on both our parts, but the basics are firmly in place and I think we're both at a better place now then we were at the Medals in September. Not really sure when I'm gonna go back up and ride. It's sooo cold and windy today that if I went up tonight after work he would hate me forever, and plus I would be miserable. I might try Wed night and Thursday night. Friday we're supposed to get dumped on with snow, but hopefully I can get in atleast one ride on him this weekend. Also wanted to add that I was looking him over the other afternoon after our ride and his body is looking great. He's at a good weight, he's muscular and fit and his top line is nice and rounded and his neck is getting a nice shape to it too. I think all of the flat and dressage work is really helping his body and he's looking awesome. In the next couple weeks I hope to have his trace clipped so reduce his sweating after rides and so I can also put on his new winter blanket that I got last year. I love this blanket and have been saving it all summer. It's a Weatherbeeta heavy fill with hood and it's in an awesome color. When I tried it on him it looked so good and fit him like a glove. I havn't put it on yet since it would be too much blanket with all his hair, but I can't wait. Just curious as to why your parents don't give you anything horsey. That's what you're about so why not? My parents tihink that if they buy me horsey things and stuff that their approving of what I do, and they don't really approve. They believe that having a horse is a huge waste of money. Their big Suze Orman fans, ughhh!